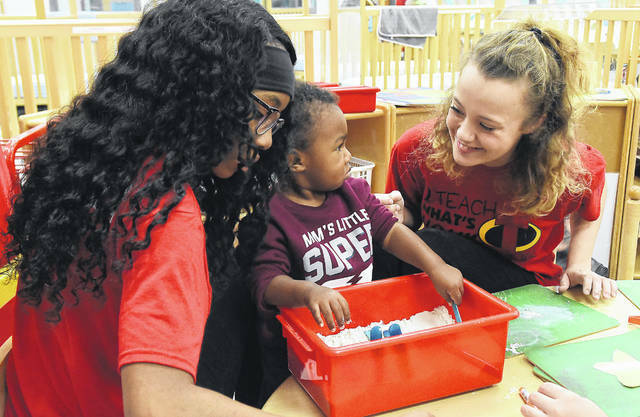 Lima Senior High School’s Early Childhood Education students Mikayla Robinson, 16, left, and Claire Mericle, 16, play with J.J. Freeman, 14 months, in a sand box. Lima Senior High School’s Early Childhood Education students Symphony Michael-Simpson, 16, left, Juan Cannon, 17, plaint with Alijah Cornish, 2, Johnisha Ewbb, 2, and Kingston Merkle, 2, at Lima Senior High School. 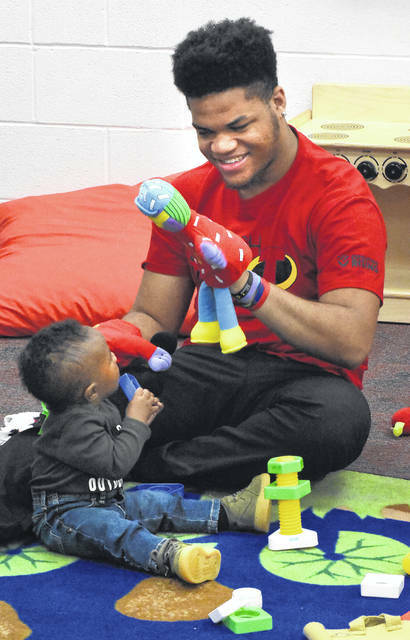 Lima Senior High School’s Early Childhood Education student, Raye’lin Walton, 18, plays with Alonzo Williams, 10 months, at Lima Senior High School. 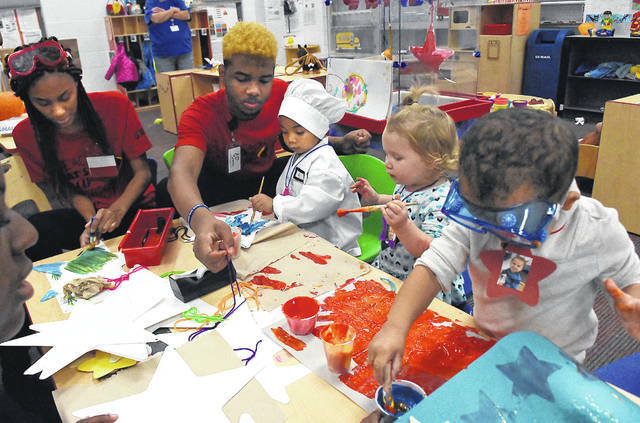 LIMA — Lima Senior High School’s Early Childhood Education and the West Ohio Community Action Partnership (formerly Head Start) infant and toddler center housed at Lima Senior have earned the Step Up To Quality (SUTQ) 5-Star Rating. It is the highest rating possible and now all the preschools in the district have the 5-Star Rating. Staff and Early Childhood Education students celebrated Wednesday by doing special activities for the children in the center. Students work in the day care as part of their training. The program will receive a 5-Star Banner to hang at the school. The program will receive a 5-Star Banner to hang at the school. STUQ is a five-star quality rating and improvement system administered by the Ohio Department of Education and the Ohio Department of Job and Family Services. It recognizes and promotes learning and development programs that meet quality program standards that exceed licensing health and safety regulations. The program standards are based on national research identifying standards, which lead to improved outcomes for children. The program’s instructor is Tina Hamilton-Shoemaker.